MoTA is a museum without physical space. Its programmes are realised in different locations and contexts, both in physical and virtual space. MoTA champions transitory art in the form of continuous events, exhibitions and educational programmes both locally and internationally. SONICA festival is conceived as a showcase of the yearly program of MoTA. It is an experimental festival that questions the ways of representation, exhibition formats, crossing borders between digital and analogue, object and performance. Each edition of SONICA brings us a display of audio-visual performances, interactive installations, lectures, digital workshops, projections, clubbing nights and public urban installations. We talked to MoTA & SONICA’s Neja Tomsic. Can you talk about the history of MoTA & SONICA? MoTA started as an art-focused offshoot of another association (Codeep) that was active for almost ten years in the field of urban culture, visual communication and electronic music. We started MoTA as a residency programme (at the time there were only occasional residency programmes in Slovenia, but our aim was to create an ongoing one). After a year, we organised the first SONICA – a month long exhibition conceived as a festival. It was staged in a gallery and works were added and removed during the whole month, there were concerts, screenings and talks, and resident artists were also using the gallery as a work space. I could say that each SONICA after that was different: in terms of content, length, structure. Throughout the years we responded to things we think about and discuss, what we think is important and relevant for our time and we adapt the festival format to that. So beside having a strong focus on sound, art and technology, I can say that SONICA is a showcase of our year’s work. Meanwhile, MoTA has grown into much more than a residency programme. We are a somewhat nomadic venue in Ljubljana, and active throughout the year: we organise exhibitions, produce artworks, tour, promote and educate. Can you talk about MoTA’s focus on ‘transitory art’. Can we interpret this focus as a reaction to the relatively static nature of these institutions in general? Yes, definitely. Transitory art is in a way an attempt to name art opposed to contemporary or even media art – two terms that are becoming obsolete, and even more so, don’t mix. Rarely are museums of contemporary art really what their name says they are, unless contemporary art has already ended. And as art always should be explorative, curious, critical and open-ended, it also should step out of the museums and galleries, simply to stay relevant. So we always look for new contexts and forms, and we do it under the term transitory art, perhaps a bit provocatively. Can you talk about MoTA’s background in terms of creative development and local context (the legacy of Ljubljana’s famous new media scene)? As I said, MoTA’s background is in urban culture and throughout the years, the organisation’s mission was always to discover and revive venues and places. We therefore have a strong background in reviving public space, as well as in working internationally and locally, especially in the field of music, sound and transitory art (media art, light based art, interactive art, art and science, public space interventions, contemporary art, etc– see above). Ljubljana has a strong media art and art/science scene and quite a lot of organisations active in the field. Therefore, each organisation developed a very specific profile. We mostly work outside the gallery context or try to reframe regular exhibitions in a different way. We focus on sound art and public space and there was a time this year when five MoTA projects were installed in the streets of Ljubljana (Gerada’s Tina, the Arcade Gallery, Moonolith, Cyanometer and a Valerie Wolf Gang’s video works at the MoTA LAB). As a culmination of MoTA’s annual programme, how is SONICA put together in terms of dramaturgy & concept each year? Through the years (we are now organising the 9th edition), SONICA has always been different. We choose a theme and build the programme around it. The festival always has a group exhibition, concerts, a club night, workshops and talks. We had editions with symposia as well, or an edition where the exhibition was replaced with concert nights or live art forms, or where the festival was build around workshops. So it really depends. Can you talk about this year’s programme? 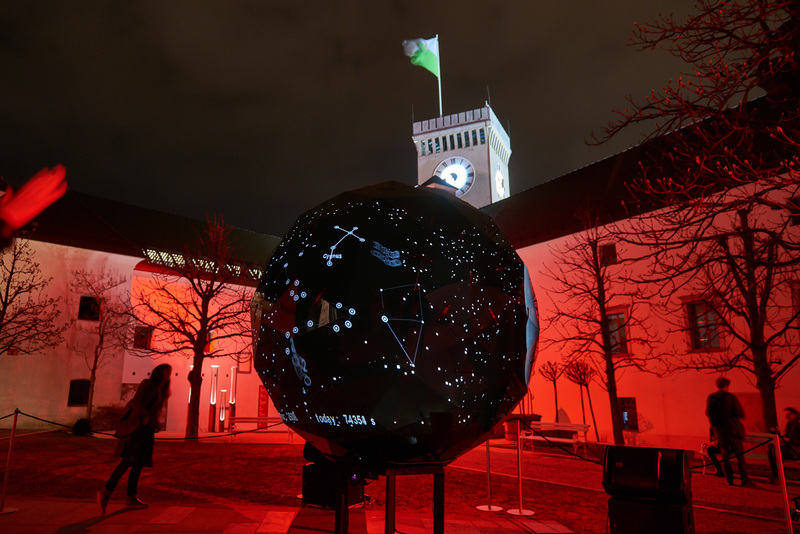 This year’s SONICA will take place from 25 to 30 September. We’re opening the festival with a SONICA Classics concert with the Polish cello player Resina (who recently collaborated with SHAPE alumna Zamilska). On Tuesday we’re opening the group exhibition DIS-, which will look at various aspects of dis-integration, especially through nature and ecology, with works by SHAPE artists Andreas Trobollowitsch, Robertina Šebjanič, Mike Rijneirse, as well as Katarina Petrović, Plateau Resideau (recent TESLA awardees), and others. On Wednesday there is an audiovisual night and Friday is the main concert day and club night, where we will hear SHAPE artist Machine Woman among others, and on Saturday we plan screenings and a concert in the part with Battle-ax. For the last couple of years MoTA has been focusing on sound and media art and architecture and we are very happy to be part of the ARTECITYA platform, within which we started the Aracde Gallery – an open air sound gallery at the Central Market in Ljubljana, the Cyanometer – a monument that measures air quality and the blueness of the sky, among others. We also started working on a new project that will map and archive public spaces and monuments in five countries, and stage artistic interventions to revive them.